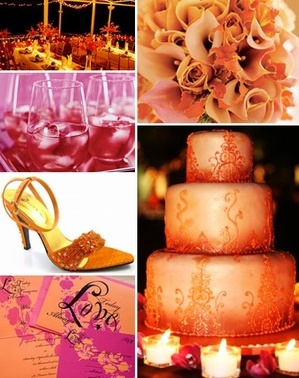 Here’s a colour board featuring the sunny, chic combo of fuchsia and orange, courtesy of Brenda from Best Weddings Site. I love this colour combo as it allows for so many possibilities – like the invitations below, it can be very depeche mode (no, not the band – it’s French for ‘fashion forward’). Highlight with gold and you have instant elegance. And eye-popping cocktails are a fab way to kick the party into fifth gear. Many orange and fuchsia flowers are tropical, so this combo has built-in tropical flair. Great for breezy summer or beachside weddings. Reception photo is from one of our beach weddings Weddings Costa Rica, rum and pomegranate cocktail from Brides.com, Orange bouquet from Brides.com, Jeweled party shoe from Dikuza.com, Love Today Tomorrow Always Wedding Invitation Collection from SandyPhotoArt’s etsy shop.